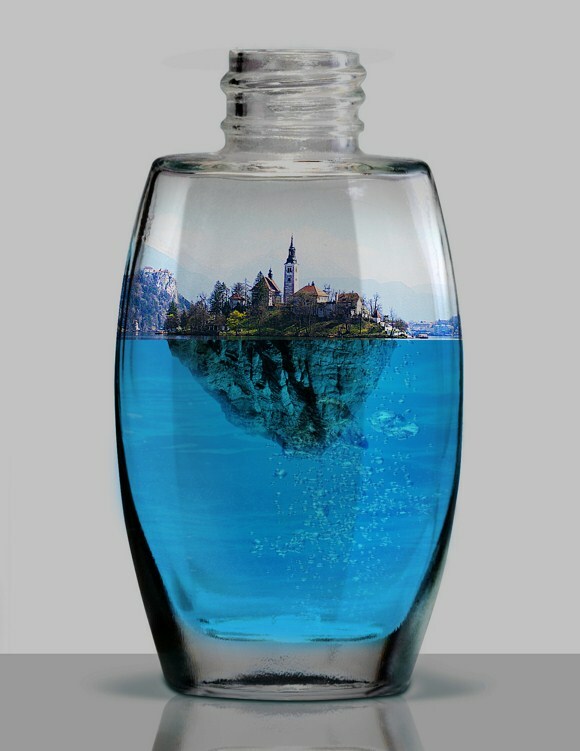 This tutorial will show you how to create a digital piece of art of a miniature, but realistic, island that floats inside a bottle. With this photo manipulation in Photoshop, you can surely amaze your friends with the amazing effects of your work! First you are going to need these 3 primary stock photos which you easily find on royalty free stock image websites. 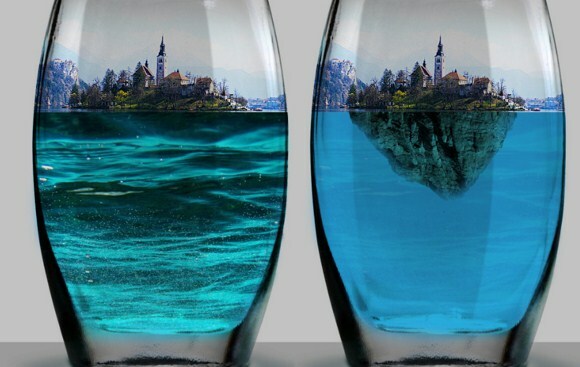 You will need to find images for an Empty Bottle, an Island, and a rocky formation. As for my own search, I used these keywords when finding the photos: island, empty bottle, bottle, glass, beaches, mountain, rocks, and beach rocks. Please see the images below. Now place or import the bottle stock image to your document. You can have any Photoshop document size or resolution for this project. 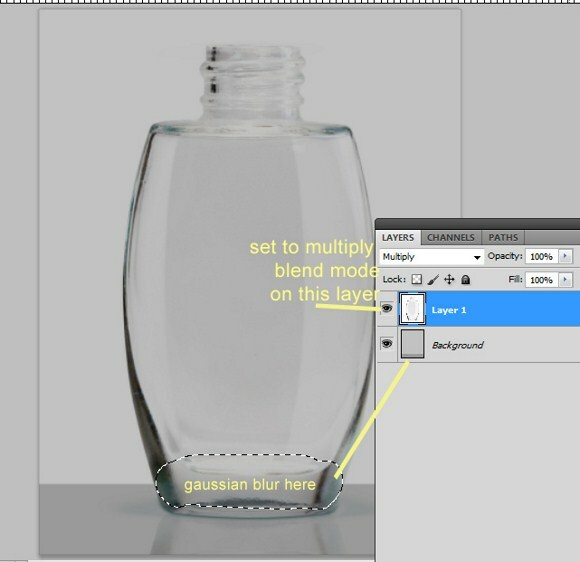 Select the bottle layer then set the layer blend mode to MULTIPLY on 100 percent opacity. You can also create an optional background but be sure that you blur any background image that goes through the glass to imitate how real glasses distort light. For now, use a simple monochrome background. 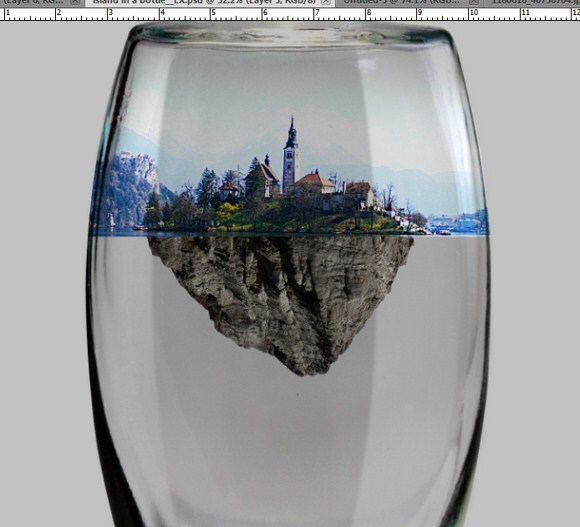 Next place the island image below the bottle layer. You may have to sharpen, add more contrast and colors to the island image so it will look better. 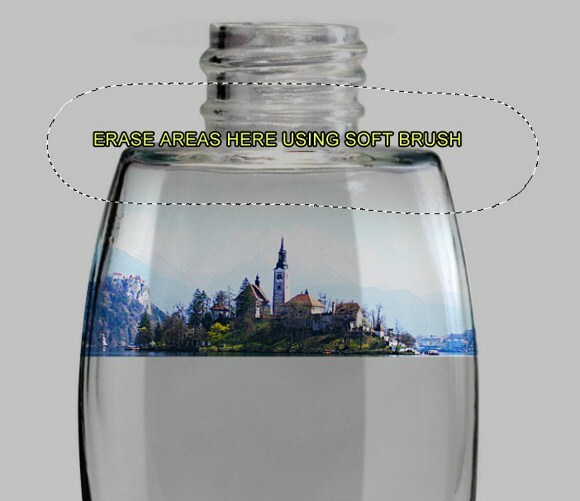 Erase all areas that go out of the bottle. On the sky areas, use a soft brush to remove the edge of the photo. Open the rock/mountain stock photo. Use the marquee tool (on my part, I used the MAGNETIC marquee which very easy to use) to isolate the parts that you only need. Use the image below as a guide on how to isolate the object. 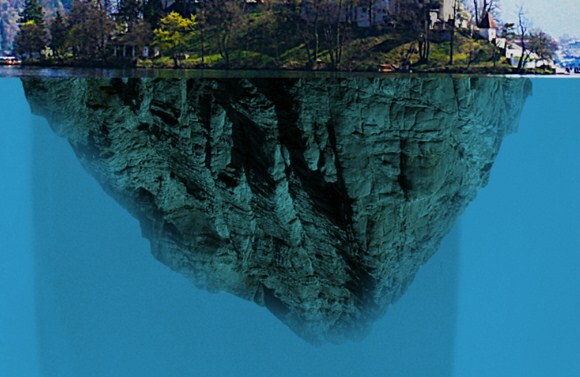 On the example, we are using a rocky mountain peak as the lower part of our floating miniature island. 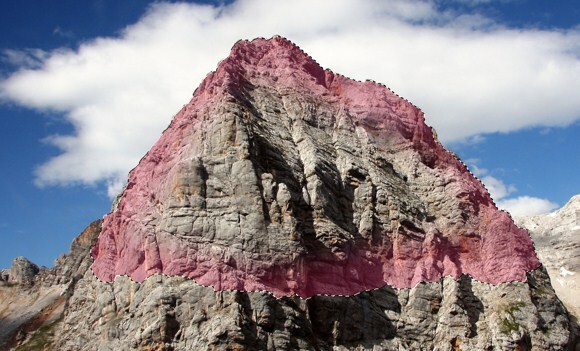 If you cannot find the image exactly below, you can use a pile of rocks or an image of another mountain peak. After selecting the important part, place it on the main document project, then invert vertically by making use of the Transform Tool (CTRL+T). 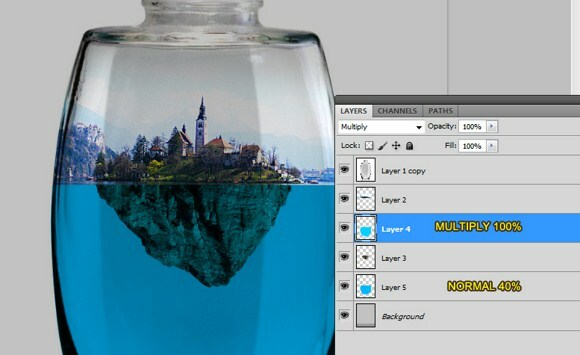 Resize the rock image so that it will not exceed the islands width. Again, you may have to adjust the rock image’s contrast and colors so that it would match with the island. Next, we will add the water. Using the marquee tool again, select the appropriate areas where water should be only present. 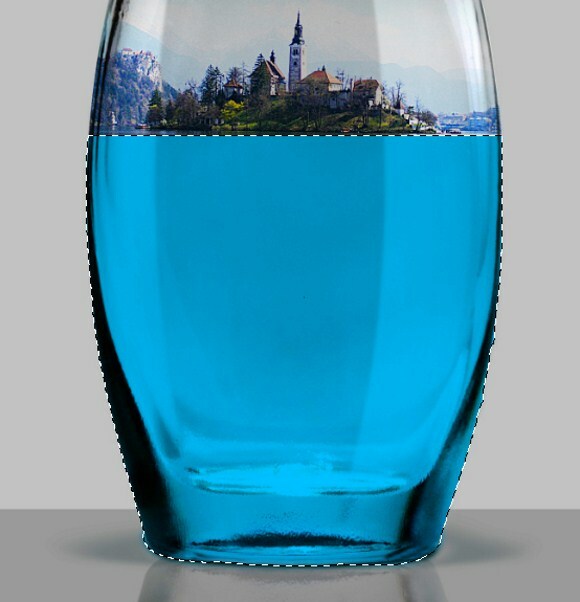 In the project, water should only be available below the island and strictly inside the bottle. Create a new layer for this water and use an aquatic color. You can also choose other colors other than blue. But for now let us just stick to blue water. Create a new layer. Now, by using the SAME SELECTION, fill the selected area with a slightly darker shade of the first color used. Arrange the layers where the ROCK layer should be in BETWEEN the water layers. Set the first layer to Multiply blend mode, then the second one to normal but with 40% opacity. Go to the rocks layer, and with the ERASER TOOL erase softly (50 percent) some areas at the edges so that it will have depth and it will really look like it is underwater. Be careful not to erase too much. Now we need to put on bubbles and waves. But if you can find bubble brushes on the web, which is pretty easy, you can use them in this project. Google the image UNDERWATER, and import the image in Photoshop. Transform and remove the unnecessary areas using marquee or eraser tools. Change the blend mode to SOFLIGHT with 20-30 percent opacity. You may search again for BUBBLES or Underwater bubbles, then import the image. You can use either overlay or Softlight for bubble. Resize and place duplicates if needed.